Escambia Academy welcomes you to join us as we run, walk, and jog while raising funds for our school! The My School Color Run is an untimed fun run/walk featuring a designated course. Throughout the course participants will experience color splash zones where they’ll be doused in color and end with a final color toss celebration! Registration includes a race bib, color packet, and t-shirt only if you sign up before 09/29/17. You can pick up your items at the registration table the day of the event. Paper registration forms are available upon request. 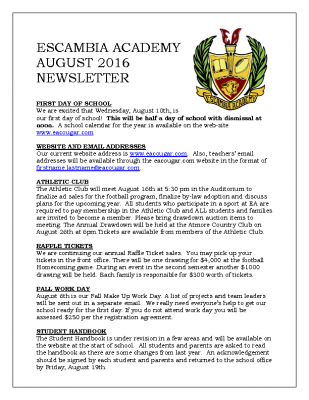 Escambia Academy will be utilizing the IRIS (Immediate Response Information System) Alert system for emails, phone messages, and text messages for information which needs to be quickly shared with our membership. IRIS will be used to notify parents/family members of changes in athletic schedules, messages for certain groups (grades, teams), etc. IRIS will also be used in the event of an emergency involving the school or community, such as weather issues, campus issues, etc. This email address will not accept replies so if you need to ask a question about the email, please forward it to an email address at “eacougar.com” for the person who is responsible for If the recipient is unable to answer the phone call and/or does not have voice mail, you can call the 281-207-4890 number back and hear the message that was originally sent. Please be aware of the email address and phone number–it is probably a good idea to identify this phone number in your contacts as “EA IRIS alert” or something similar so you do not ignore a message from this number. The “EAHeadmaster@eacougar.com” email will continue to be used for general information and any forms or attachments. We hope this will continue to improve our communication with our families. 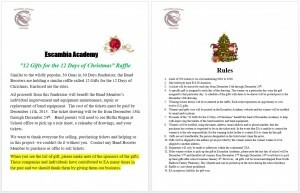 Similar to the wildly popular, 30 Guns in 30 Days fundraiser, the Band Boosters are holding a similar raffle called 12 Gifts for the 12 Days of Christmas. Enclosed are the rules. All proceeds from this fundraiser will benefit the Band Member’s individual improvement and equipment maintenance, repair or replacement of band equipment. The cost of the tickets must be paid by December 11th, 2015. The ticket drawing will be for from December 13th through December 24th. Band parents will need to see Birtha Ragan at School office to pick up a rule sheet, a calendar of drawings, and your tickets. We want to thank everyone for selling, purchasing tickets and helping us in this project- we couldn’t do it without you. Contact any Band Booster Member to purchase or offer to sell tickets. When you see the list of gift, please make note of the sponsors of the gifts. These companies and individuals have contributed to EA many times in the past and we should thank them by giving them our business. Limit of 500 tickets to be sold numbering 0001 to 0500. One ticket per each $10.00 donation. 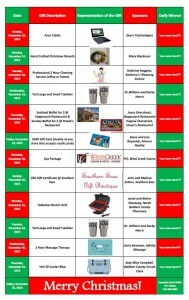 A ticket will be drawn for each day from December 13th through December 24th. A specific gift is assigned to each day of the drawing. The winner on a particular day wins the gift assigned to that particular day. 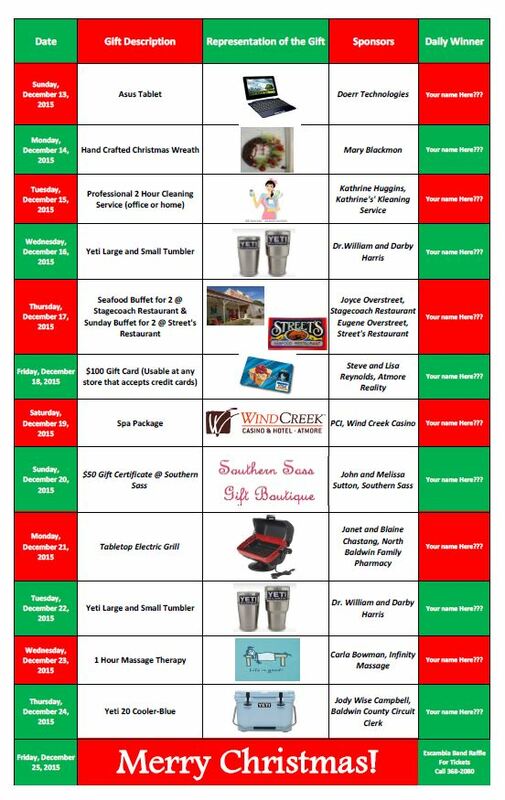 A schedule of the gifts with dates to be drawn will be posted prior to the December 13th drawing. Winning tickets drawn will be re-entered in the raffle. Each ticket represents an opportunity to win twelve (12) gifts. Winners and gifts won will be posted on the Escambia Academy website and the winner will be notified by email and/or phone. 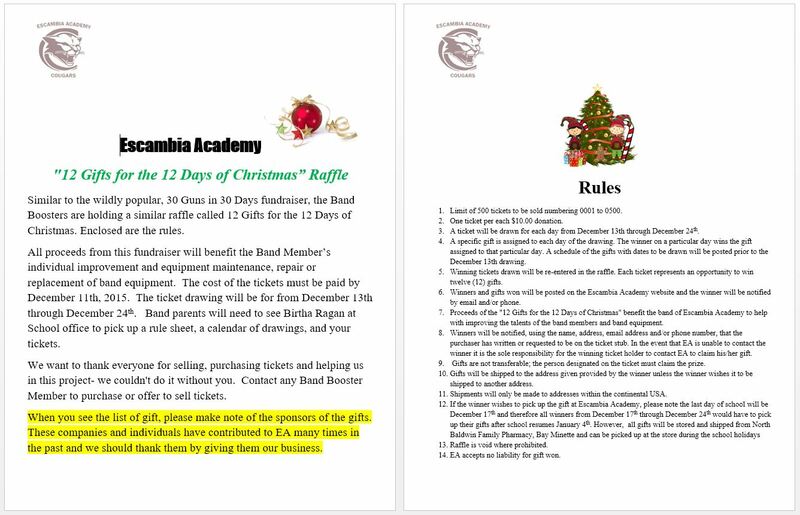 Proceeds of the “12 Gifts for the 12 Days of Christmas” benefit the band of Escambia Academy to help with improving the talents of the band members and band equipment. Winners will be notified, using the name, address, email address and/or phone number, that the purchaser has written or requested to be on the ticket stub. In the event that EA is unable to contact the winner it is the sole responsibility for the winning ticket holder to contact EA to claim his/her gift. Gifts are not transferable; the person designated on the ticket must claim the prize. Gifts will be shipped to the address given provided by the winner unless the winner wishes it to be shipped to another address. Shipments will only be made to addresses within the continental USA. EA accepts no liability for gift won. Thank you to everyone who participated in the Fall Festival–it was a great success and was enjoyed by all. The PTO organized a fun event for everyone and we appreciate their hard work. Don’t forget–Thanksgiving Break is November 23-November 27th. During Thanksgiving Break, work will begin in the Elementary School for repainting of the hallways, auditorium and office area. An informational pamphlet was sent home on Friday with elementary students. The classrooms will be repainted over the Christmas Break and more information will be sent closer to this time. As the weather turns cooler, each student should review the Student Handbook for the dress code on pages 8-11. Particularly, there are no hoods allowed on clothing at school. Please see me if you have any questions about an item being appropriate for school. We are excited to offer the opportunity to order Winter Apparel with the EA logo on it. Attached is an Order Form for these items–there are samples available in the office. The first order will be made on Friday, November 20th so please turn in order forms with payment before that time–checks should be made to Escambia Academy with “Winter Apparel order” noted on the Memo line. We expect to have the items ordered available on Monday when we return from Thanksgiving Break. Additional orders will be filled as order forms are turned in with payment. All of the items offered (except the Sport Shirt) are appropriate for school wear according to the dress code. These items will make great Christmas gifts for friends and family as well! We are proud of the Fall Sports Teams and the successful seasons they had. Basketball will begin soon and the schedules are available in the school office and will be posted on the eacougar.com website. We will be deciding the date for the Fall Sports Banquet soon and will send out that information when available. AUBURN – Escambia Academy put up a good fight against Lee-Scott Academy earlier tonight, but the Warriors prevailed to win 35-24 in the quarterfinals of the AISA Class 3A state playoffs. The Cougars and Warriors played a close first half, abd traded scores in the second half before LSA took a lead it would never give up. LSA drew first blood after only two plays when stout running back Mitchell Lewis ran the ball 62 yards on a sweep play with 11:23 left in the first quarter. Lewis finished the game with five touchdowns on the night. EA answered with a nice 34-yard Kainoa Gumapac pass to Trey Tuner. The Cougars trailed 7-6 after not converting their first extra point attempt. EA wouldn’t be able to cash in on extra point attempts the rest of the night. After recovering a Lewis fumble and on the next EA offensive possession, Cougars running back Kris Brown made LSA pay with a 95-yard run for a touchdown with 10:02 left in the first half. Lewis scored his second touchdown with 6:55 left in the first half, and the Warriors took a 14-12 lead into the break. Right out of the gate, the Cougars came out scoring on a 67-yard dash from Turnerto take back the lead with 9:35 left in the third quarter. EA led 18-14. After trading possessions and EA getting things rolling on defense, the Warriors found running room on a 21-yard TD rush from Lewis. With the extra point, the Warriors took a 21-18 lead. Gumapac found Pat McGhee for a 53-yard strike on the first play from the line of scrimmage to put the game back in the Cougars’ court. The Cougars were able to hold Lewis on a fourth-and-two play to start the fourth quarter, but their offense couldn’t get anything going, deciding to punt with the down at fourth-and-three. LSA then took its lead it would never give up on a 48-yard running score with 8:33 left in the game. LSA scored its final touchdown of the night after putting together a more-than 5-minute drive to go ahead 35-24 with 47.6 seconds left. With the ball and 39.9 seconds left in the game, the Cougars tried everything they could getting down to the Warrior 37-yard line, but didn’t get the ball in the end zone. EA finishes its season 7-5. EA Cougars Varsity Football at Bessemer Academy, Thursday, October 29th at 7:00 p.m. Students attending this game who are not at school on Friday are subject to the Attendance Policy as outlined in the Student Handbook. Please check with Mr. Walker if you have any questions. Our Varsity Football team has qualified for the First Round of AISA Playoffs. We will play Lee Scott Academy in Auburn on November 6th at 7:00 p.m. The office will have playoff tickets available for purchase the week before the game. If you are planning to attend, please purchase your tickets from the office so our school can keep our share of the funds from ticket sales. If you wait to purchase your tickets at the game, EA will not receive any portion of the ticket sales. We are launching our new website later today. It will still be located at www.eacougar.com. Many thanks to Tim Doerr for his development and continued work. Some areas are still a “work in progress” and will be updated as information is available. We look forward to sharing this with our members, potential students and community. The link for our Live Stream for football games will still be available through the website.